Okay, I’m a day or so late on this one, but did you guys hear about the two new Kindles that are being released?!? The 3rd generation Kindle will be priced at $189 and available in while or gray, and the new Wi-Fi Kindle will be only $139 ($139!!!). One of the main differences between the two is that the $139 one only runs on Wi-Fi and the regular $189 Kindle runs on either Wi-Fi or AT&T’s 3G broadband network. The Wi-Fi Kindle’s battery life is longer too if you keep the wireless turned on all the time. I personally never turn my wireless on anyway unless I want to browse the Kindle store because it does make a significant difference in the battery life. 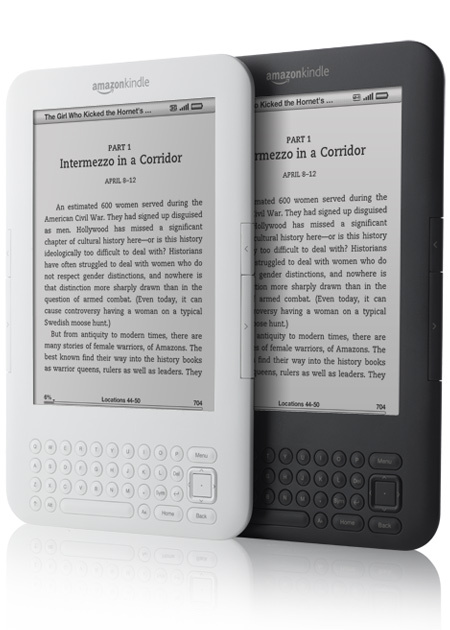 Some of the other enhancements that Amazon has made are: better E-Ink contrast, double the storage (now you can store 3,500 book… wow), quieter page turning buttons (the ones on mine aren’t LOUD, but they do “click” a little bit), and an updated selection button that is easier to use. They’re also rolling out an update to the Kindle software (they’re doing it in waves but it hasn’t come available to me yet) which will somehow let you post things to Twitter or Facebook from your Kindle. Not sure exactly how that works, but I want to try it! Everyone is comparing the e-readers to tablet computers like the iPad, and Amazon is adamant that they do not want to be compared to the iPad because they’re two totally different products and they want to keep the Kindle simple for people who just want to read. They don’t even seem interested in touch screens or color screens right now like some of their competitors. So what do you guys think? Are you going to go online and order one when they come out at the end of August? Once again, I’m a little ticked that I got mine when it was more than double the price… but oh well. I still love it and have no regrets! I had been hearing good things about this book for awhile, but just never got around to reading it until recently. I wasn’t really sure what it was about (I tend to skim over summaries on book jackets or online) but if it was supposed to be good, I figured I’d check it out. 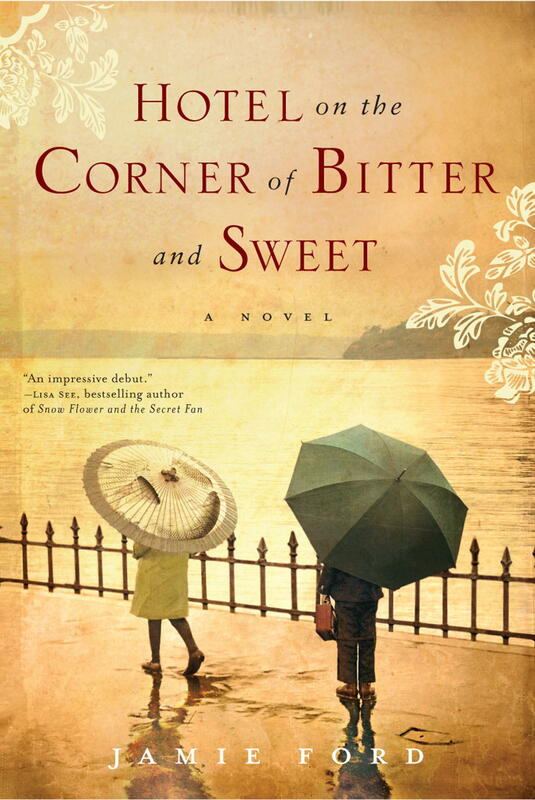 “Hotel on the Corner of Bitter and Sweet” is one of those books that jumps back and forth between time periods. It is helpful that the year is stated at the beginning of each chapter. Forgive me if I don’t follow the jumping back and forth between years exactly; it’s hard to remember. The book starts with Henry as an older man; Henry is a Chinese American living in Seattle whose wife recently passed away from cancer. He is struggling with the loss when he hears that a local hotel that had been boarded up for years recently was purchased and the owner found some items in the basement. You then find out more about when Charlie was a young child. His parents forced him to speak English, even though they only spoke Cantonese, so that he would fit in and his strict father also made him wear a button saying “I am Chinese” so no one would mistake him for Japanese, who we were in a war with at the time in the 1940′s. He was also made to go to an American school and worked in cafeteria serving lunch to get away from the other kids. He met a friend there one day who was a young Japanese American girl named Keiko. Although his father had given him strict orders to stay away from anyone who was Japanese, and especially to stay out of that neighborhood, Charlie and Keiko forged a friendship. They also bonded over a the music of a local jazz musician who Charlie hears about from his African American friend, Sheldon, who played his saxophone on the street in the different neighborhoods. When the war starts to get worse, the Japanese in Seattle are being “evacuated” to camps more inland. Keiko and her family are forced to leave and Charlie tries everything that his 12-year old self can do to help them, but they still must leave. Charlie manages to get a job helping the woman that he works with in the cafeteria; they will be serving food at the Japanese camps. He goes there looking for Keiko and her family, and after awhile, finally finds them. When Henry’s father finds out that he’s been associating with a Japanese person, he disowns Charlie and refuses to speak with him anymore. Keiko is then moved to a different camp, and Henry and Sheldon make a bus trip to pay a visit and at that time, it seems like Henry is officially courting Keiko. Once he goes home, they write to each other often, until the letters start coming less and less. Henry writes one last letter to Keiko once the war is over and it is rumored that the Japanese are coming home from the camps. He asks her to meet him in front of the hotel at a specific time. I will leave off there and you can read the book to find out the rest! As you know, I like historical fiction. Other than the fact that I did learn some things about what was going on in the 40′s during the war, it was just a really good story. The story does switch back and forth between young and old Henry, and my summary above left out most of the old Henry story. It’s one of those books that really drew me in so that I didn’t want to put it down. It was also a sweet love story that shows you how powerful love can be (even between two teenagers) in difficult times. Loved it! … But am I a total loser or something? I have not read ANY of these and not even heard of most of them! The only one that I’ve even heard of is the Steig Larsson book, “The Girl Who Kicked the Hornet’s Nest.” I’ve been meaning to read that trilogy, but other things/books/authors have taken precedent and I haven’t gotten around to buying them yet. Has anyone read any of the ones on their top 10 list? Or the Fiction or Nonfiction list? Maybe I just have particular taste in genres and authors, but I thought I would have at least heard something about some of these. It’s just a random list that doesn’t necessarily mean anything, but still. I like looking at these lists sometimes to get recommendations if I run out of books to download. Still looking for some new books to get for your vacation? Here’s Amazon’s list of summer reads. Some of them sound really good! Amazon Wish List, here I come! Jane Green is one of my favorite authors and when her newest book came out a few weeks ago, I had already pre-purchased it for my Kindle and started reading as soon as it was delivered/downloaded! This is her 12th book, by the way! The story starts with a New York City health food chef, Steffi, who offers to dog-sit for Malcolm, a customer of the restaurant where she works. Her wannabe rock star boyfriend hates dogs, so it’s just perfect timing that they’d be on the outs. When Steffi decides that maybe she needs a change from the hustle and bustle of the city, she also takes Malcolm up on the offer to stay at his farmhouse in the country, which happens to be located pretty close to where Steffi’s sister lives and she thinks it would be nice to see Callie and her family more often. Steffi LOVES living at the farmhouse and begins to make friends with the locals and starts to sell her cooked and baked goods at a local store. She starts spending more time with her sister Callie, who is a happily married mother of two who also is a professional photographer on the side. Soon after Callie’s family throws her a party to celebrate her birthday and the 4th anniversary of surviving breast cancer, she starts to get horrible headaches and blackouts. After she sees her oncologist, who is also a close friend, it is determined that the cancer is back and has spread to her brain. She knows that she does not have much time to live, so she tries to make the best of the time she has left with her family, and her friend and family rally around her to make her last days as happy and comfortable for her as possible. This is not exactly a happy, light, fun summer read, but that shouldn’t discourage you from not reading it (even though it may have made me cry a little). It DOES get emotional and sad in the second half of the book, but it also shows you the power of family and friends and love. It is also inspiring to see how strong a person can be when they are facing something so difficult. All of the characters seemed so… real, and their emotions and reactions to Callie’s diagnosis really made the story seem realistic. The story was loosely inspired by Jane Green’s friend’s battle with cancer. As I mentioned above, this is Jane Green’s 12th novel. I think I’ve read almost every single one of her books and hope she keeps on writing! !